Ashoka is tolerant to air pollution and is effective in alleviating noise pollution. Hence it is recommended for 'green belts' for the mitigation of air and noise pollution. Ashoka is a small to medium sized evergreen tree species growing to a maximum height of 9 meters. Its handsome evergreen drooping foliage and branches spreading in all direction assumes a shapely crown. Ashoka is a native tree species scientifically known as Saraca asoca (syn. Saraca indica), and belongs to Fabaceae family of the flowering plants. It is called as Anganapriya, Ashopalava, Ashok, Hempushpa, Kankeli, Madhupushpa, Pindipushpa, Vanjula, Vishoka and Vichitra in Sanskrit; Oshok in Bengali; Ashoka in Oriya; Ashopalava in Gujarati; Jasundi in Marathi; Asogam in Tamil; Ashokam, Hemapushpam and Vanjulam in Malayalam; Ashokamu and Kanakelivanjulamu in Telugu; and Achenge, Ashunkal, Ashokadamara, Ashanke, Kenkalimara and Akshth in Kannada. Ashoka is important tree in the cultural traditions of the Indian sub-continent. The flower of Ashoka tree is the state flower of Odisha state of India. Due to decline in population Ashoka is listed as ‘Vulnerable’ in the Red List of Threatened Species of International Union for Conservation of Nature and Natural Resources (IUCN). Vulnerable species are those which are likely to move into endangered category in the mid-term future if the causal factor continues to operate. 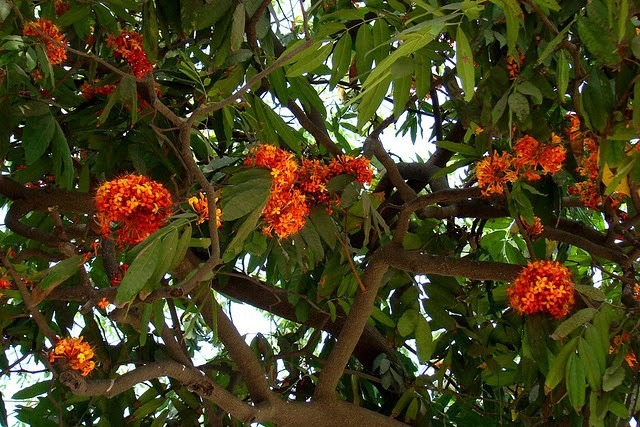 Though the population of Ashoka is dwindling, isolated wild trees of Ashoka are found in foot hills of Central and Eastern Himalayas, in scattered locations of Northern plains of India as well as on the west coast of the India near Mumbai. Ashoka has been associated with the Indian culture from very early periods. Due to its frequent mention in Indian epics and Jataka tales and extensive depiction in several Buddhist sculptures, Ashoka is very much known as sacred plant. The Ashoka tree is considered sacred throughout Indian sub-continent especially in India and Sri Lanka. Ashoka, as the name signifies, is believed to be capable of relieving the sorrow of people. It is considered a symbol of love, being dedicated to Kama, the Indian God of love. The tree has been mentioned in Indian epic Ramayana. In fact Sita the wife of Lord Ram was kept interned by Ravana under the Ashoka tree. Hence, Ashoka is also called as Sita Ashoka. In Hindu religion the Ashoka tree is worshiped in Chaitra the first month of the Hindu calendar. Ashoka tree is also regarded with veneration in Jainism. It is believed that Mahavira the founder of Jainism had renounced the world under Ashoka tree in Vaishali. False Ashoka is a lofty tree species with drooping branches and beautiful green foliage. It is scientifically known as Polyalthia longifolia and belongs to Annonaceae family of the flowering plants. False Ashoka is also native of India. It is a very popular park and garden plant of the India sub-continent. The plant is effective in alleviating noise pollution. False Ashoka is also known as Madras Ashoka. Ashoka is found wild along streams or in shades of evergreen continental forests of South-east Asia, South west China and Eastwards. In Indian sub-continent it occurs almost throughout the country up to an altitude of 750 m in Central and Eastern Himalayas and Khasi, Garo and Lushai hills. Being a rain forest tree its original distribution in India is in central areas of the Deccan Plateau, as well as the middle section of the Indian sub-continent. Flowers in Ashoka tree appears during February-April. The flowers come in heavy lush punches. They are small fragrant bright orange-yellow in colour, turning red before wilting. The seeds are borne in flat, leathery compressed pods. The tree mainly propagates through seeds. Medicinal value: The bark extract of Ashoka is used for the treatment of uterine disorder particularly uterine hemorrhages, dysmenorrhea, menorrhagia and leucorrhoea. The bark is bitter and found to cure inflammation and enlargement of the cervical glands, stimulate and relax the plain muscles of the ileum. Furthermore, bark is used to cure syphilis, dyspepsia, dysentery, colic, piles, ulcers and pimples. The leaves of Ashoka possess blood purifying properties and their juice mixed with cumin seeds is used as an indigenous treatment for stomachache. Flowers pounded in water are used in the treatment of haemorrhagic dysentery. The dried flowers are found effective against dysentery and diabetes. They also proved to be an excellent uterine tonic. Ashokarista and Ashokaghtam are some of the important preparations from Ashoka. Ornamental value: The evergreen foliage and beautiful flowers of Ashoka make it a handsome tree hence it is planted in gardens and residential compounds as an ornamental plant. Green belt value: Ashoka is tolerant to air pollution and is effective in alleviating noise pollution. Hence it is recommended for 'green belts' for the mitigation of air and noise pollution. Sacred value: Being regarded as sacred tree by Hindus and Buddhist it is planted near temples. Miscellaneous value: The pods are used as good forage for cattle. In state of Assam, the light reddish brown wood of the Ashoka tree is employed in making ploughs and shafts. It can be concluded that Ashoka is a threatened plant species of immense economic value. Besides fulfilling the medicinal and ornamental needs the plant is helpful in alleviation of environmental pollution. Therefore, the conservation of the valuable Ashoka tree species is the need of the hour for the fulfillment of various human needs of the present as well as future generations.